In this tutorial, I will share a secret with you. 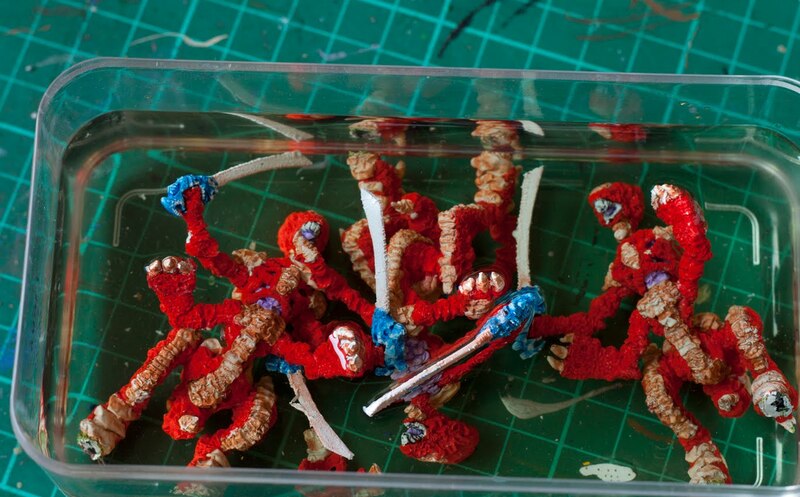 You can go on any hobby forum and guaranteed you'll see the question "How do you strip paint from models?". Well, look no further, once you've tried the Garfy method you'll be amazed at how fast and simple it is. Read on to discover how. There is a UK company called Superdrug, it's a pharmaceutical high street shop and it sells cosmetics. One of the items it sells is Acetone Free Nail Polish Remover. A container large enough to put your models in. Glass is best, plastic is ok, but the AFNPR will eat through plastic eventually. Stage 1: Place your models in your container and pour AFNPR into the container. if your container has a lid, DO NOT use it. I once had a glass container with an air tight lid and after carrying out stage 1 I fitted the lid and because there is a chemical reaction and gases are released the glass jar cracked and a hole was blown out of the bottom of it. Luckily I was doing this over the bath and no one was hurt. 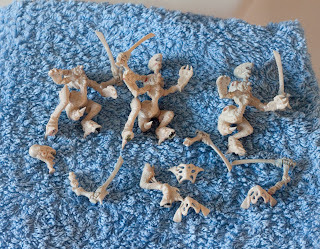 Stage 2: Leave the models to soak for 10 minutes. It doesn't take much longer then this to be honest. Plastic models exposed to AFNPR for prolonged periods will melt. Metal models can take a much longer dip with no damage. 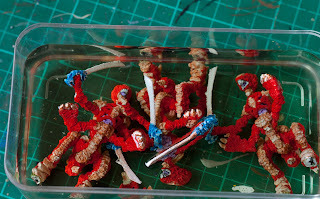 I'm not sure about resin, but I suspect it will be the same as plastic, so don't risk it. Click on the picture above for a close up. You can see how all the paint has bubbled up after just a couple of minutes. It's that fast! 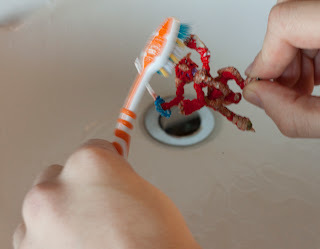 Stage 3: Using the old toothbrush (or your partner's toothbrush if you're planning some form of revenge) lightly scrub off the old paint job. It comes off in huge chunks, it just falls off the model. Stage 4: Above is my efforts after just 10 minutes of scrubbing. Sometimes if the parts were lightly glued they'll come apart, so if you're working over a sink make sure you have the plug in the basin. Stage 5: Because of the chemical nature of AFNPR it's a good idea to rinse it off the models. You don't want a reaction with your undercoat spray. 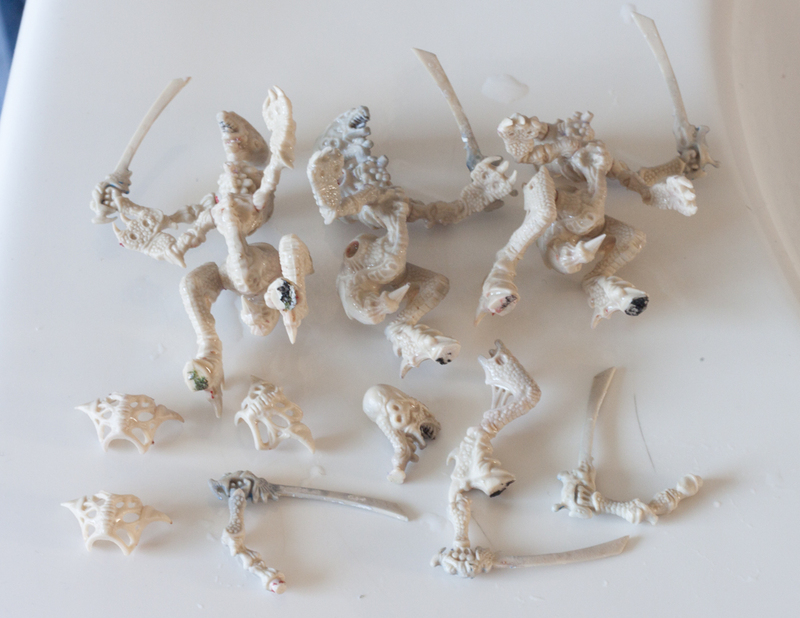 I've dunked these models into the sink basin of warm water. Stage 6: Towel dry the models or leave to air dry. Nice! I've been looking for something to strip plastic minis with for some time now. Great post, Garfy. Also, congrats on your latest mention on the GW blog. I have used acetone free nail varnish remover before and it works very well. I also use Fairy Power Spray and break fluid (although break fluid is quite noxious and so I wouldn't recommend it). 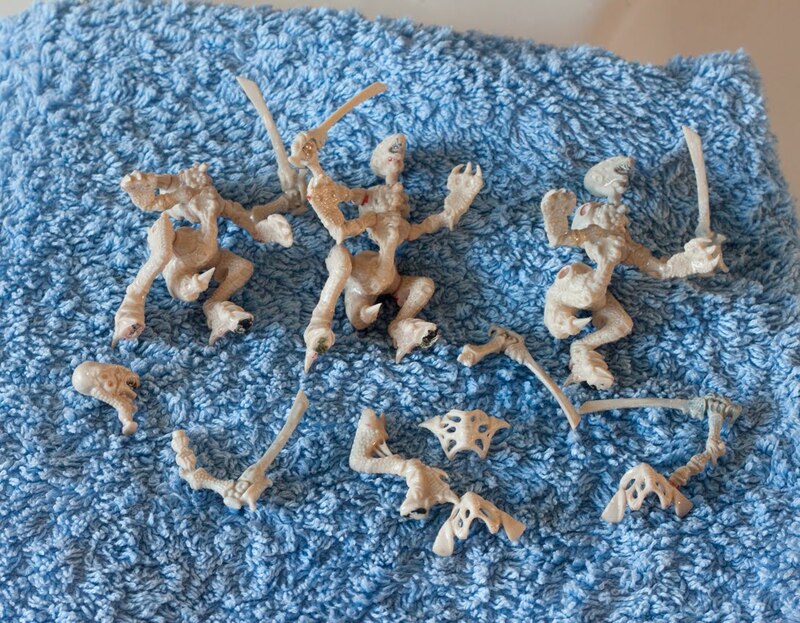 Ive only ever stripped metal models though, not plastic. Great Post. I as well have been looking for a good tutorial on how to strip models quickly and easily. Would any Acetone Free Nail Polish Remover do the trick for us that done have any Superdrugs near us? Great tutorial! I'm always having a hard time stripping paint from plastic. Let's see if I can find acetone free nail polish remover in Germany. Thanks for that tutorial, it really was a great help. Now I finally can do horrible things to other people's toothbrushes but the old toss-into-toilet. Seriously though, that's a neat trick. I was pretty happy with the old break fluid on plastics so far but I'll make sure to check the Acetone free nail polish remover. Yes please, I too need some recommondations for products in Germany! I use Detol (the brown one) and it has the same effect. Great tutorial though as not a lot of people know these methods. 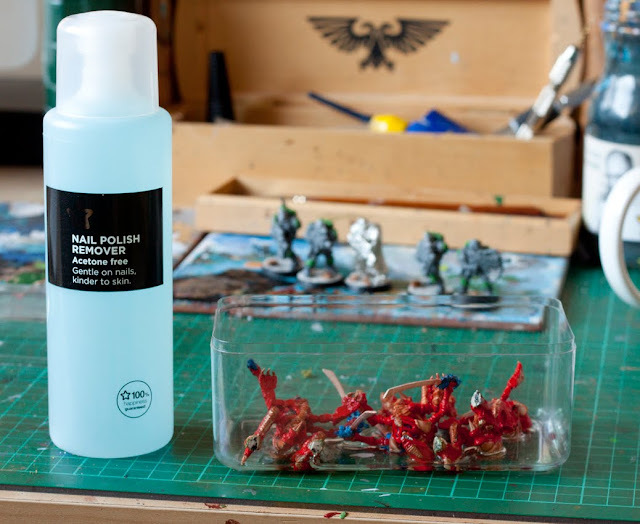 would any Acetone Free Nail Polish Remover work on plastic marines? I don't see why not, I've only used this stuff though. I tried this on Friday and was amazed on how quickly it worked! 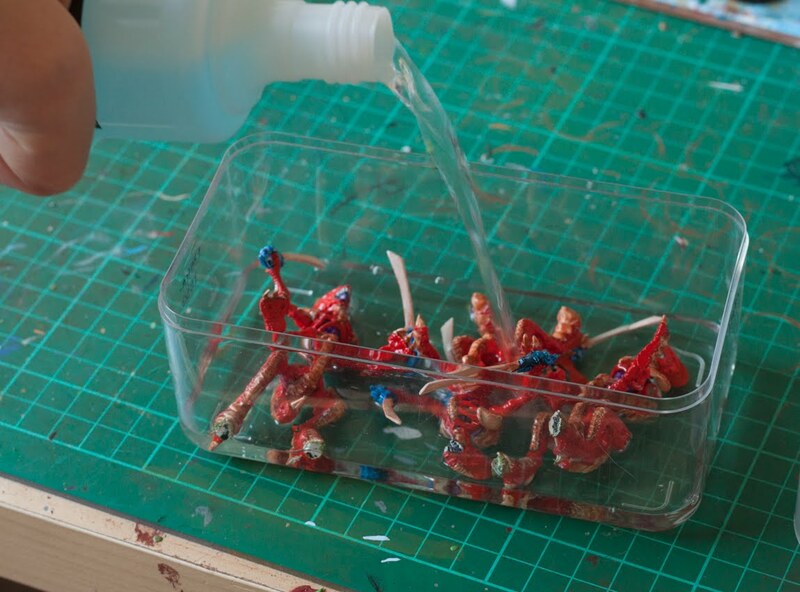 I dunked a few Space Marines and the layers of paint started to sluff off. 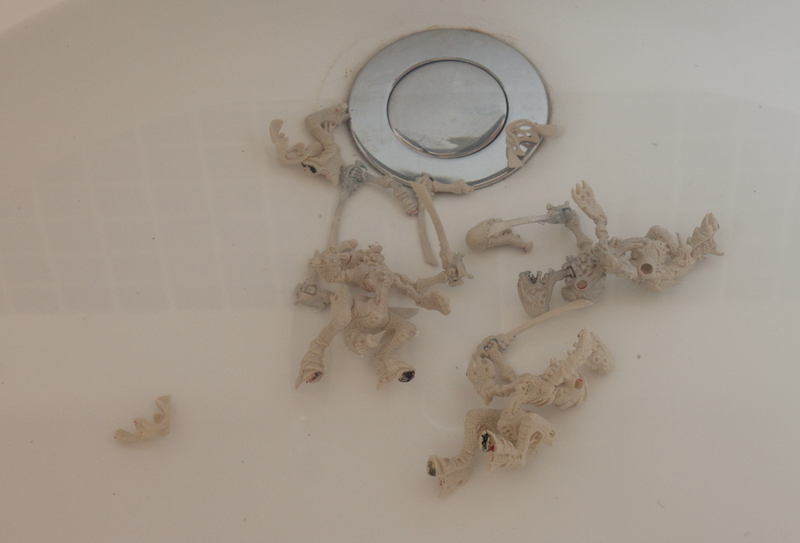 I didn't have them in for more then five minutes and then scrubbed them under a running tap. 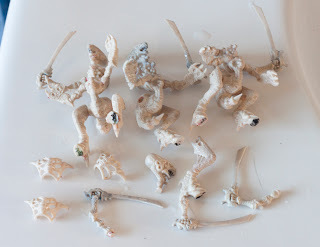 I did notice that some of the thinner plastic parts became soft. I would only use this on thicker minis and would not try this on something like a Necron. I think it would just melt them.